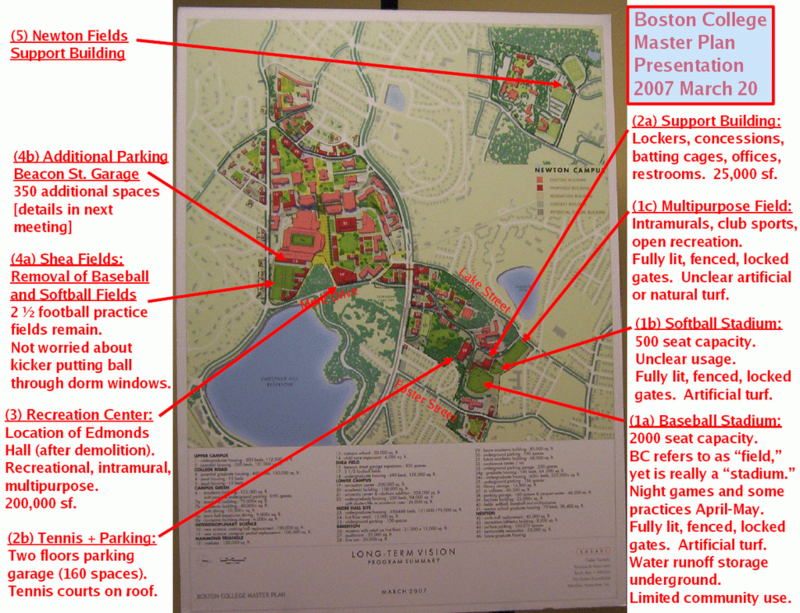 At the Boston College Task Force meeting on Tuesday, March 20, 2007, Boston College planners and their partners at Sasaki Associates presented a housing plan for the next ten years of their development and expansion. A PDF version of the figure can be found attached to the post at the GoogleGroup BC_Neighbors_Forum. athletics: varsity, intramural, and informal recreation. * split #1 into a, b, and c.
* split #2 into a and b. 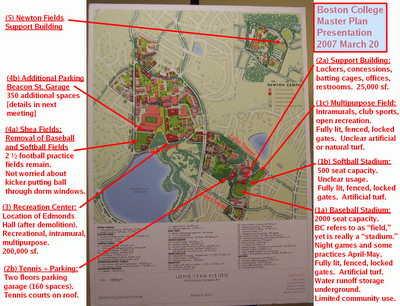 * added #4b (parking addition next to Alumni Stadium [football]. (1)(a) Baseball Stadium: 2000 seat capacity, probably on benches. Press box behind home plate. Put into natural features of site. 20, 2007 meeting). Will be fully lit for night games and practices. back into water table. Will be fully fenced, gated, and locked off. lowest-capacity baseball stadium in ACC. (1)(b) Softball Stadium: 500 seat capacity, probably on benches. artificial turf, then have underground tanks (like baseball stadium). Will be fully fenced, gated, and locked off. Unclear community usage. offices, restrooms. 25,000 square feet (sf). usage, multipurpose, primarily oriented to student use. 200,000 sf. water table. Unclear if natural or artificial surface. program nonetheless. 350 new parking spaces to be added. (5) Newton Fields Support Building. Near to BC Law School in Newton.